Planning a trip to the United Kingdom probably seems pretty easy. The language is almost never a problem, the visa requirements are not particularly onerous for vacationers from North and South America, Australasia or Europe, and there's a good choice of ways to arrive and get around. And, you know, it probably is as easy as all that. You could pop over to London and take a few day trips in the immediate area, then spend a day or two venturing a bit further afield - to Oxford or the Cotswolds or Stratford-upon-Avon and, hey presto, what a great vacation you've had. 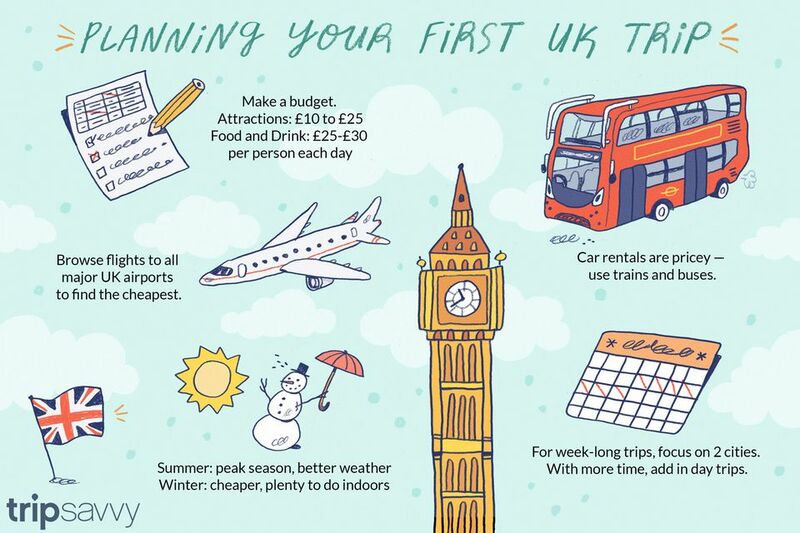 But whether you buy your vacation basics online for yourself or use a travel agent to book a tour, a little advance planning can open your eyes to corners of the UK you never even heard of, let alone thought of visiting. It's all a matter of asking yourself the right questions. Considering who you really are (from a travel perspective at any rate) and what you really enjoy seeing and doing can turn an okay trip into a great one. But where do you start? The 10 questions that follow should help keep your vacation planning in sharp focus. Unlike some vacation destinations that are more suitable for couples than families, or older than younger people, the United Kingdom has something for everyone. It's just a question of choosing wisely for your party. Time to zero in on your travel profile. A couple planning a romantic trip? Think about romantic things to do and see, the best places to smooch in Britain or some very nice spots to pop the question. A family traveling with children? Young and old will enjoy all the treasures on the Harry Potter trail, the fun at Legoland Windsor, the farm holidays, family cycling, and camping trips. The UK has one of the world's best (and its first) safari parks. And there's even a rich family schedule at the world famous Edinburgh Festival. A large group? Plan a trip for a sports team, a hiking party, a group of cyclists, a clan reunion, a class trip by checking out hostels or the new, more glamorous "poshtels." Or consider large vacation rentals; there are some remarkably luxurious homes, suitable for a big family reunion, that are good value on a per person basis. Outdoor enthusiasts looking for adventure? The UK's varied national parks have some of the best free hill walks, mountain hikes and sheer cliff climbs in the world. Go fossil hunting on the Jurassic Coast and check out the surf on the beaches of Cornwall. Some of the UK's most remote parks in England, Scotland and Wales are now registered as world-class Dark Sky Reserves where you can go star gazing in blissful peace. And if it's an adrenalin rush you're after, check out the Northern Hemisphere's fastest zip line in Wales. Mature and looking for peaceful surroundings? Try one of the UK's lovely country house hotels, where accommodations range from traditional to modern boutique, where spa treats and pools are common and where the food is almost always superb. Pet owners? Learn about the UK Pet Travel Scheme that makes it easier than ever to bring the family pet along on your travels. Then check out tried and tested dog-friendly hotels. Being clear about exactly who is going to the UK—to the members of your party, yourself, or your travel agent—narrows the infinity of choices and makes planning your UK trip that much easier. How much will a vacation in the UK cost? There's no upper limit and minimums depend on the season, the last minute deals you can find, where you are starting out from, and so forth. Consider these prices as approximate guidelines only. The round trip fare for two people flying to London from an East Coast USA departure point varies from about $1,200 to more than $4,000 depending upon the time of year. How to save: The price of some package tours (including car and hotel) can be less than booking a flight alone. Most of the big transatlantic operators, including American Airlines, British Airways, and Virgin Atlantic, offer good value packages. Before you book a hotel, flight, and car separately, spend some time searching for cheap packages. Renting the smallest car with a manual transmission will cost between $350-$500 for a couple of weeks. To that, add the cost of gasoline and you'll see that renting a car, in a country with excellent trains and public transportation, may not be such a good idea. (In June 2018, petrol in London averaged about £1.19 a liter.) You can save by using other ways to get around. Take the Underground in London, try Britain's rail services, and take the train. For total freedom, buy a BritRail pass. Even cheaper: hop on a bus. The average price of a night in a UK hotel in 2016, was just under £100 - but the average price of acceptable hotel accommodation in most major cities was still above £100, with London and Edinburgh leading at about £135 to £145. Check out some of these ideas on how to save on accommodations. And if your aim is London, have a look at some cheaper places to stay just outside the capital. Expect to pay a minimum of £25-£30 per person per day. If you're really on a very tight budget, these are some ways to save on food and drink. From £10 to £25+ per adult, per attraction. You can save a great deal by buying a UK discount pass. Some of them are only available to overseas visitors and are remarkably good value. How Much Time Do You Have in the UK? Trying to fit too much into your UK vacation is bound to leave you feeling rushed and unsatisfied. But you probably don't cross oceans very often so you will want to make the most of the time you have. Consider these planning approaches. Plan a two-center vacation: You might visit two cities that you find interesting - London and Edinburgh or Glasgow are popular combinations - or plan a short city break with some adventure at the beach or in a national park. Use a city as a hub: If you base yourself in one of the UK's main urban hubs you can explore it and take one or two-day trips to nearby towns or scenic regions. Most UK cities are well connected, by bus and rail, to their surrounding region. Try using several cities, in different parts of the UK as a basis for further exploring. Combine London with York and Edinburgh, for example, Cardiff with Birmingham and Manchester or Glasgow. There are loads of opportunities for exploring historic sites, family attractions, castles, and stately homes within an easy train or car journey of most UK cities. Spend a few days in a city and then take off on an in-depth exploration of a region. Some adventurous fell walking in the Lake District, for example, combines well with the UK's indie music city, Manchester. Edinburgh or Glasgow pair well with Loch Lomond and the Trossachs National Park. London makes a good partner for some time spent exploring Suffolk - the England of dreams, and East Anglia. Take on a long distance hike, cycle or mountain bike trek along one of the UK's national paths, like The South Downs Way or the 7stanes Trails. The UK has pretty much a two-season climate. Spring and autumn are both just brief, passing hints of summer and winter. Which of the two main seasons you choose will influence the price you pay and what you'll be able to do. Prices are lowest from mid-October to the end of March, but the days are also shortest. In mid-winter, lights may be on all day in bad weather. Sunset before 5 p.m. is typical of December and January. Hogmanay, Up Helly Aa Viking festival, and Beer Festivals all over the place. People sometimes forget that there's a lot more to the UK than England. This is, after all, a United Kingdom of England, Scotland, Wales, and Northern Ireland. And each nation of the UK has its own distinctive personality. Probably the most varied of the UK's nations, England offers urban lifestyles, country living, empty beaches, rugged coasts, national parks, historic touring, markets, shopping, lakes, hikes, riding, cycling—a kind of United Kingdom in miniature. Scotland is the emptiest of the nations of the UK with great, beautiful stretches of highlands, dramatic lochs, rolling borderlands and upland moors. It also has two of the UK's most exciting cities, Glasgow and Edinburgh, and some of it's wildest holiday celebrations. Wales is more rural than most of the UK. It has storybook pretty valleys and wonderful areas for walking. In Snowdonia, it has the highest UK mountain outside of Scotland as well as several brilliant waterfalls and cascades. In 2017, the view from the top of Snowdonia was voted the best view in Britain in a survey of 3,500 visitors. And, if you like castles, this is the place to be. Wales also has gorgeous beaches and miles of protected, heritage coastline. If you tour and visit local pubs, you are likely to hear Welsh spoken as a first language in parts of North Wales. Belfast is experiencing a cultural revival and Northern Ireland is finally being discovered by visitors. Ulster, as it is also known, has lovely, rural landscapes, dramatic coastal features like the Giant's Causeway and some of the UK's oldest historic monuments. It also has an open border with Eire (the Republic of Ireland)* - you know you've crossed when the currency changes from sterling to euros. *Following the UK starting the process of exiting the EU at the end of March 2017 (BREXIT), the status of the open border is in doubt and subject to negotiations. Ireland is within the EU but Northern Ireland, part of the UK, will soon be leaving it. Are you outdoorsy? A history or literature buff? Mad for shopping and pampering? Maybe you like museums? The beach? Wonderful scenery to photograph? The nice thing about the UK is that it has all the variety you might expect of a country with its rich and long heritage. Yet it's all packed into a relatively small land mass. With so much within easy reach, you could drive yourself mad trying to do and see everything. Far better to plan your trip around one or two kinds of activities you really enjoy. Manchester - Clubland and indie music central. Plus two great football teams. From castles, stately homes, museums, and historic gardens to literary icons of the English language, you are never far from the UK's rich cultural heritage. What Kind of Accommodations Do You Prefer? To some degree, where you decide to stay on your first or your fiftieth visit to the UK will be a matter of price. But there are other things to consider when you are choosing the kind of accommodation you'll opt for in the UK. The way you travel (tour or stay put) the amount of do-it-for-yourself you're up for, the way you do or do not make friends on vacation are all factors. So what kind of digs will you choose? If you are touring, staying one night here, one night there, a cheap chain hotel might be an adequate and reliable choice. On the other hand, if you are looking for a luxury or romantic experience, fine dining, bags of charm, a country house hotel might be a choice that provides indulgence for less than you might pay for similar luxury in a city. Vacation home rentals are great for independent travelers who like to cook their own meals, come and go as they please. They're also a good and money saving choice for families and groups. And these days, there a lot of amazing, historic vacation rentals available - Agatha Christie's summer home, for example, or a 14th-century hall house hidden behind brambles worthy of Sleeping Beauty. Like a friendly environment and a chance to meet lots of people? A hostel (or these days, a "poshtel") might be just the trick; they're a lot more comfortable, clean and convenient than you might think. Or, if you are ready to graduate from couch surfing, Airbnb is just as popular—with just as many opportunities and risks—in the UK as it is in most other countries. B&Bs can offer great breakfasts, warm and friendly hosts, good locations and loads of charm without massive expense. But choose wisely. A grim B&B with an intrusive or unpleasant landlady can be dire. The AA—The UK Automobile Association—publishes an authoritative guide to the best B&Bs. House swap to live like a local for free. It's safer and easier than ever before. And there is house swapping choices in all the cool places. If you like living under canvas, there's no shortage of camping opportunities in the UK. There is both wild (tent) and caravan (RV) camping all over the UK. Many RV parks are open year round. Are You a Conservative or an Adventurous Diner? The kinds of food you prefer to eat or the amount of cooking you are prepared to do for yourself can make a big difference for both your budget and the places you choose to go. If you like to try a different style of food every night, London is the place to be. Some of the best seafood in the UK is available in the Southwest (Devon and Cornwall), on the Northeast coast, and in Scotland. Cities with big ethnic populations have excellent ethnic restaurants. The Balti--a derivative of Pakistani cooking--is amazing in Birmingham. If you're traveling with a family of fussy eaters, vacation home rental, hostelling or apartment hotels with their own kitchenettes may be your best bets. Dress-up or Casual: Which Do You Prefer? Some of the most exclusive restaurants and hotel dining rooms in London require men to wear a jacket and tie (the Ritz, for example) but that kind of formality is on the wane. What the British call "smart casual" which basically means you've made an effort and it shows, but you haven't gone "over the top" is acceptable in most nicer restaurants. If you like to go clubbing and you want to get into the best clubs, you have to look the part. Bring your hippest club gear or buy some when you arrive. If you think you can get into a nightclub in jeans and a t-shirt, plan on being Taylor Swift or Beyoncé. Some country house hotels will expect you to "dress for dinner" but most won't. Smart casual is usually more than acceptable. If you are planning to stay at a very grand country house hotel, it is worth asking about dressing for dinner before you leave home - just in case. Going to the theater or a concert does not require dressing up unless you feel like it. If you are heading for the races at Ascot, the Henley Regatta, or Glorious Goodwood, a very smart dress is the rule. For women a smart skirt suit or a flowery dress (and on Ladies Day, a hat); for men, suit and a tie. Many men choose to wear formal morning suits and top hats on Ladies Day at Ascot—but if you have not been invited to the Royal enclosure, don't worry about it. How Will You Travel to the UK? If you are flying to the UK—and most non-European visitors do—you have a bigger choice of airports than you might imagine. Most visitors choose Heathrow or Gatwick but, if you are able to fly into one of the UK's other international airports, you could save money or land more conveniently at your ultimate destination. If you are lucky enough to cruise to the UK, you'll likely arrive at Southampton, Harwich, or the new luxury cruise port in Liverpool. You can give yourself the experience of arriving in the UK by sea and, for example, seeing the White Cliffs of Dover, without the commitment of an ocean cruise. Fly into a European city—Amsterdam, Paris, Brussels, Dublin, Belfast—and take a ferry. Ferries from Ireland come into the UK at Fishguard in southwest Wales, Holyhead in northwest Wales and Liverpool. Ferries from Continental Europe arrive at a range of the English Channel and North Sea ports. The Channel Tunnel has made a world of difference to traveling to the UK from Continental Europe. It is now much easier than ever before to combine a European touring vacation with a trip to the UK, with or without a car. If you are driving, take the Eurotunnel Car Transport Shuttle, also known as The Chunnel, from near Calais to Folkestone. Touring without a car? Take the Eurostar from Paris and other continental points, direct to London in about 2 hours and 15 minutes. BritRail Pass holders can book Eurostar tickets at a discount. 10 Myths About the Brits - or - Yes They Really Can Cook! What are Bank Holidays and How Will They Effect Your UK Vacation. What Will Brexit Do to Your UK Holiday This Year? Are These Celebrity Chefs Worth Leaving London For?